The H3 combines interior comfort and user-friendly controls with the rugged looks and off-road durability that have become synonymous with the Hummer name. The H3's inline-five engine may leave more aggressive drivers hungry for more power, despite its almost alarming thirst for fuel. The Hummer badge offers far more in prestige than the H3 offers in value, especially compared to its competitors in the luxury SUV segment. While the H3 represents a fine blend of on-road refinement and off-road durability, buyers will pay a price in lost performance, diminished cargo capacity, and poor fuel economy. 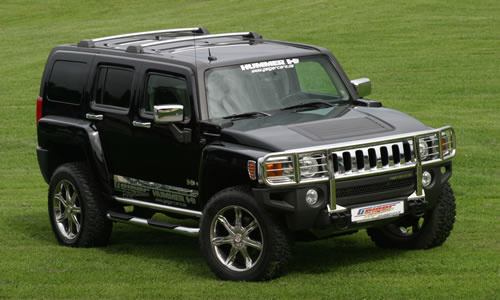 The 2009 H3 carries over from the previous model year, when Hummer added the new V8 Alpha trim, standard side curtain airbags, and an optional rear backup camera. The current model lineup splits into five trims, ranging from the entry-level Base to the appearance-oriented H3X. Positioned in between are the Adventure, Luxury, and Alpha trims, each addressing a unique, desirable SUV niche. The H3 Adventure includes an off-road suspension package equipped with ultra-low gearing and a locking rear axle for the most serious trail conditions. 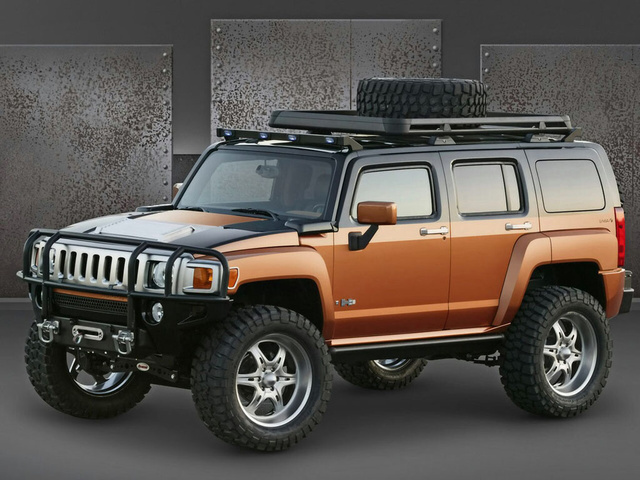 The H3X gains a body color grille, a chrome brush guard, 18-inch chrome wheels, heated leather power seats, a Monsoon sound system, and chrome exterior trim. All H3 trims, excluding the Alpha, house a 3.7-liter inline-five, generating 239 horsepower and 241 pound-feet of torque. A five-speed manual transmission comes standard with this engine, while a four-speed automatic can be had as an option. All five-cylinder models boast a towing capacity of 3,000 pounds with the manual transmission and 4,500 pounds with the automatic. A 5.3-liter V8 powers the new Alpha trim, providing 300 hp and 320 lb-ft of torque. 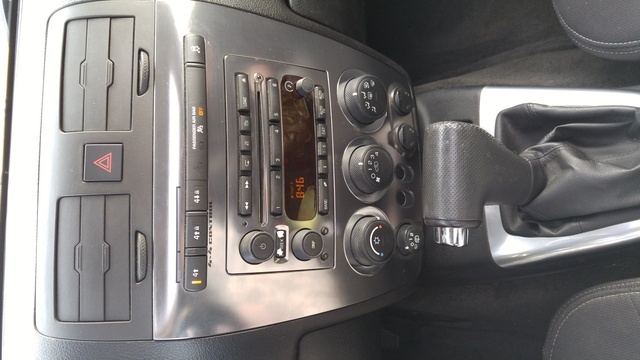 The four-speed automatic transmission becomes standard with this engine, while the five-speed manual is not available. The Alpha has a maximum towing capacity of 6,000 pounds. 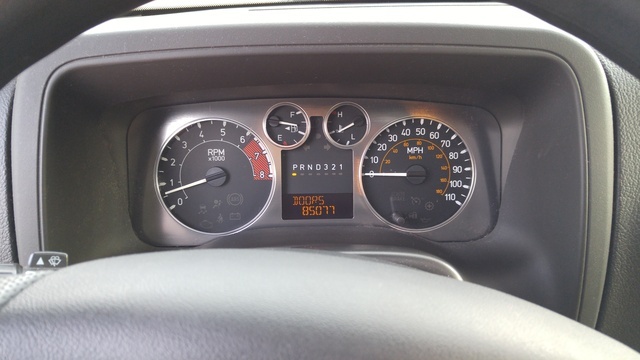 Fuel economy estimates are 14/18 mpg with the five-cylinder, and 13/16 mpg with the V8. Both mills power a capable all-wheel-drive system with low-range gearing for off-road excursions. While the five-cylinder H3 hesitates off the line and struggles with highway passing and merging, the Alpha's V8 will resolve such issues; Hummer claims a respectable 0-60 mph time of 8 seconds with the larger engine. The Alpha requires premium fuel, while the five-cylinder models do not. According to road tests, the H3X trim offers the most balanced ride, thanks to its 18-inch tires. All other trims easily absorb small bumps at lower speeds, but those bumps will be far more palpable if encountered during highway cruising. All H3s are susceptible to some body float at higher speeds. While the brakes have a somewhat soft feel, reviewers describe stopping power as adequate and well-controlled. Handling is one area in which the H3 distinguishes itself from its larger sibling, the H2. 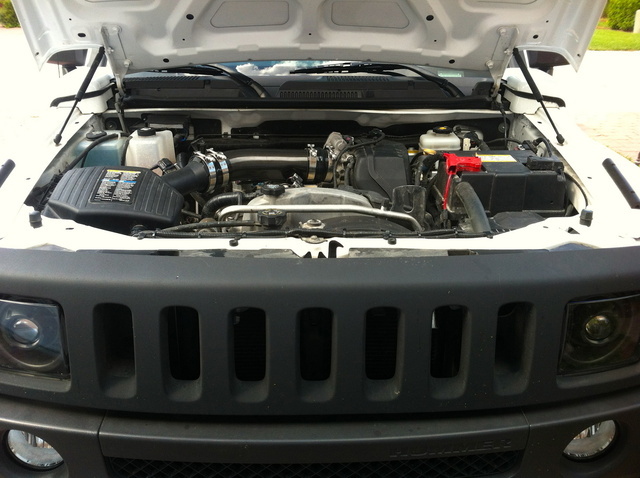 All H3s will breeze through tighter turns with a level of agility not typically associated with the Hummer name. The H3 also combines a sturdy and responsive steering system with a tight turning circle, together producing a reassuring and controlled feel on and off the pavement. While similarly shaped sport utilities will often subject passengers to an almost intrusive level of wind noise, the H3 cabin comes well-insulated from such intrusions. Passengers will also find tire noise minimal. The Hummer's quiet cabin also benefits from an organized and easy-to-operate set of controls, but the optional navigation system may cause some distraction and frustration due to its less user-friendly layout. 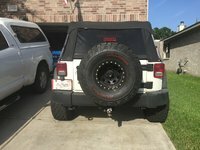 The backup camera, also an option, almost becomes a necessity on the H3, as its already slight rear visibility is further compromised by the hatch-mounted spare tire. While the H3 has a considerably smaller footprint than its massive H2 counterpart, headroom, legroom, and shoulder space are still abundant, but taller passengers will be more comfortable in the front seat. Cargo room and interior storage are both compromised in favor of passengers. The H3 wagon offers 55.7 cubic feet of cargo space, while the crew cab falls to 35.7 cubic feet. The Base H3 comes well-equipped, complete with full power accessories, heated power front seats, an auto-dimming rearview mirror, a DVD entertainment system and a six-speaker CD sound system with XM radio. Both the Alpha and the HX3 upgrade to a seven-speaker Monsoon system with an in-dash 6-CD changer. Upper level trims also gain leather upholstered seats, steering wheels, and shifters. Standard safety features on all trims include ABS, traction control, and first- and second-row side-curtain airbags. Like all current GM vehicles, the H3 is equipped with the OnStar emergency response system. In the NHTSA Frontal Crash Test, the H3 earned a five-star rating for the driver and four out of five stars for passenger protection. The H3 also received a perfect score for front seat and rear seat safety in side impact crashes. The Insurance Institute for Highway Safety deemed the H3 "Average" in front offset and side impact crash tests, and "Poor" for rear crash protection. Drivers have praised the H3 for its combination of unique and rugged exterior styling with a functional and comfortable interior. Many consumers also offer up strong recommendations for add-ons like the rear backup camera and the premium Monsoon sound system. A common complaint addresses poor visibility and blind spots, due to wide pillars and short windows. Owners also warn about accumulating operating expenses; costs related to poor fuel economy and limited parts availability can add up fast. 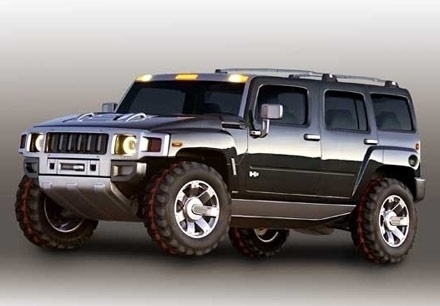 What's your take on the 2009 Hummer H3? 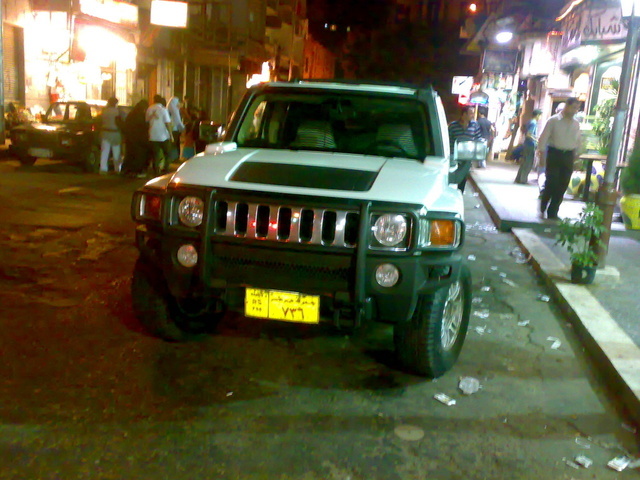 Have you driven a 2009 Hummer H3? 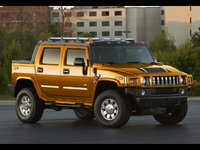 Every time it rains the 09 hummer h3 I have gets soaked on floor behind drivers seat and only there! Any suggestions would be appreciated!